It's extremely rare for Wall Street to be as calm as it is right now. The VIX volatility index plunged this week to the unusually-low level of 9.8. That hasn't happened for this closely-watched "fear gauge" since December 1993. To put that into context, that was the month that President Bill Clinton signed NAFTA into law. Here's another way to think of it: a single-digit VIX (VIX) reading has happened in less than 0.2% of all trading days since 1990, according to ConvergEx. "There is an overwhelming market narrative that equates to, 'Don't worry, be happy,'" Nicholas Colas, chief market strategist at brokerage firm ConvergEx, wrote in a recent report to clients. For many investors, it's a relief to see the calm that has washed over Wall Street. Recall that back in August 2015 the Dow briefly plunged more than 1,000 points in a single day, sending the VIX spiking to 41. 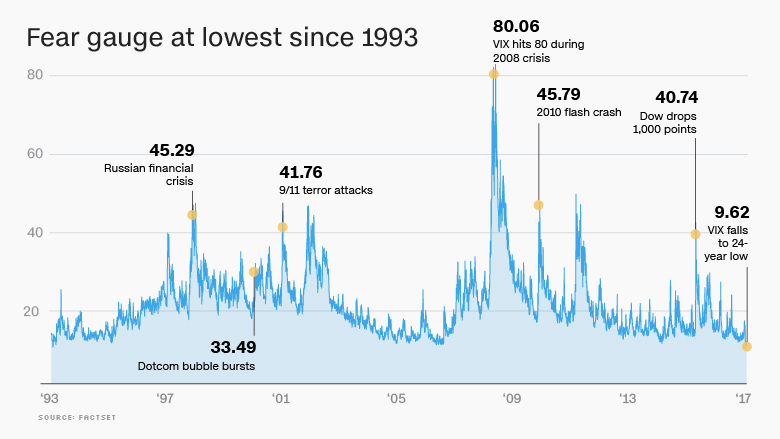 And of course in the fall of 2008, as the financial crisis was unfolding, the VIX rocketed above 81 as markets crashed after the implosion of Lehman Brothers. That wasn't fun for anyone. But some worry that today's extremely low levels of volatility are artificially created by the Federal Reserve and signal that Wall Street has become complacent about risk. Consider all the uncertainty surrounding the timing, impact and consequences of President Trump's economic agenda. "There are plenty of risks in the world and I for one see risks highest when measures of risk are now as low as they are across financial markets," former Federal Reserve governor Kevin Warsh said on Monday at the 22nd annual Sohn Investment Conference. Warsh knows a thing or two about risk. During the 2008 financial crisis, Warsh frequently huddled with former Fed leaders Ben Bernanke and Tim Geithner about how to stabilize the system. Warsh explained that he's a "worrier," calling it a "scar of the financial crisis -- and not sleeping for a few years." "I would not look at a VIX of 9.5 or 10 and take comfort. I would take fear," Warsh said. Of course, there may good reasons for markets to be calm right now. On Monday alone, the VIX plunged 8% and the S&P 500 closed at a record high as investors cheered the victory by pro-EU candidate Emmanuel Macron in France's presidential election. 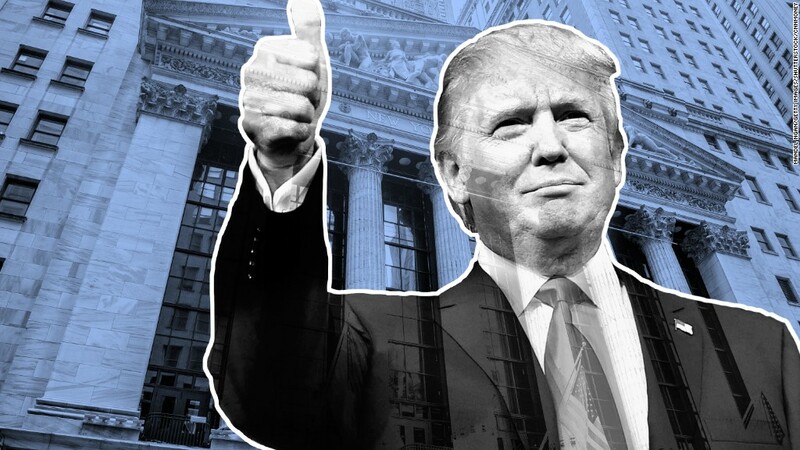 Wall Street also remains optimistic that despite Trump's early stumbles, he and Republicans in Congress will eventually reach a deal to slash corporate taxes. A tax cut could boost corporate profits and lift stock prices as well. CNNMoney's Fear & Greed Index is sitting comfortably in "neutral" territory, recovering from a brief slip to "extreme fear" in March. Some worry that things have gotten a bit too quiet, for unnatural reasons. "Too little vol is too much of a good thing," Kit Juckes, global head of FX strategy at Societe Generale, wrote in a report to clients on Tuesday. "Is it evidence of a quiet, news-free world? Not really." Instead, observers blame the lack of volatility on extremely low interest rates from the Fed and other global central banks. While the Fed has finally begun to raise interest rates, they remain historically low and its balance sheet has more than quintupled since 2008 to $4.5 trillion. Rival central banks, namely the European Central Bank and the Bank of Japan, are still experimenting with negative rates. "Super-easy monetary policy is creating artificially low volatility and driving money into trades and investments that are mispriced as a result," Juckes said. The question for investors today is whether low volatility signals smooth sailing ahead or a rude awakening in store. History doesn't help here. The VIX has only closed below 10 in three periods since 1990: December 1993, December 1994, and late 2006/early 2007. ConvergEx's Colas notes that in each case, US stocks were down one year later, losing between 2% and 6%. But that's where the story diverges. In 1995, the S&P 500 recovered to soar by 34%. As everyone recalls, 2008 was an atrocious year for investors as the market lost nearly 40% of its value. "Will next year resemble 1995 or 2008?" Colas asks.